When your wedding is coming up, you’re going to be sending out plenty of correspondence. There are notes, thank you cards, invitations and other items that will be sent out before and after your wedding. 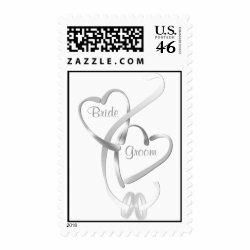 You can make correspondence more personal when you use personalized wedding stamps. 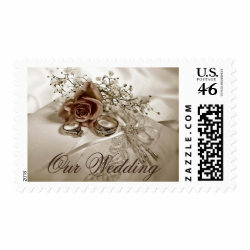 Personalized wedding stamps are available in a wide variety of styles and designs. Stamps are used to send out thank you notes and invitations. They are also used on response cards that are sent out with invitations. 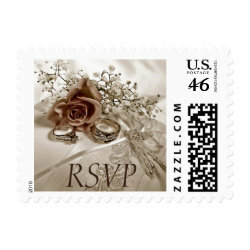 You can enhance the look of your envelopes by using stamps that have a wedding theme. 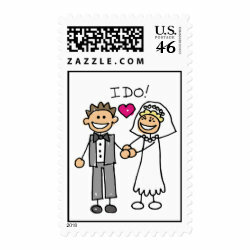 One of the benefits of ordering personalized wedding stamps is that you can choose the exact amount that you need for the item you’re sending. For example, rather than having to add two stamps to a heavy invitation envelope, you can order a stamp with the precise postage necessary. Postage stamps come in a wide variety of styles and in different sizes. You can choose from many different wedding themed designs. 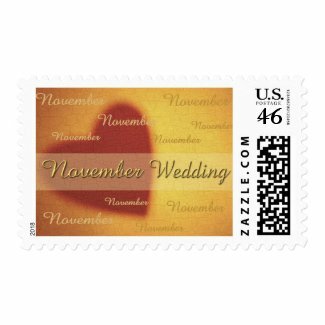 There are stamps to suit every wedding theme and color choice. 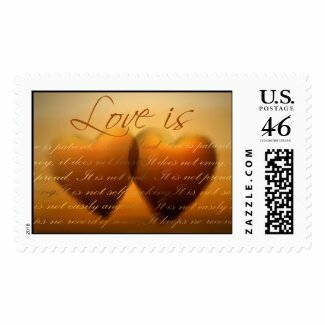 Since you need to purchase postage anyway, why not buy postage stamps that enhance and personalize your envelopes? When you buy stamps, consider all of your needs so you will purchase enough for all of your requirements. It is helpful to weigh the completed envelope to determine the precise amount of postage required. If you are unsure, take the envelope to the post office to have them tell you the postage that it will require. 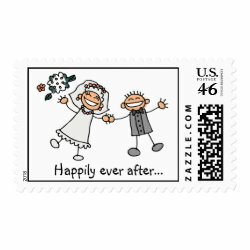 Besides choosing from the many various wedding stamps available, you can also choose personalized stamps. You can choose your own photo image to be used on the stamps. This allows you to create a very unique and personal touch for your wedding and thank you envelopes. PM Custom Weddings offers a large selection of wedding stamps, including monogram stamps, and custom photo stamps to personalize all of your wedding mailings. 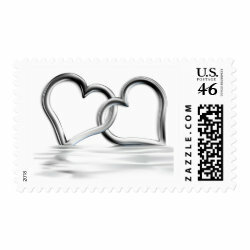 Classic silver heart wedding stamps will add an elegant touch to all of your wedding mailings. The entwined hearts are a symbol of the bride and groom becoming one as a couple. 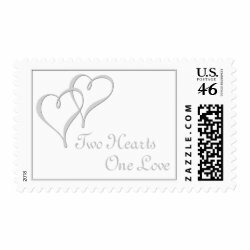 Get the elegant linked silver hearts postage, or the marriage quote “two hearts, one love”, or personalized wedding stamps with the bride and groom’s names in silver hearts. Enhance your wedding invitations with our elegant wedding stamps designed in sepia tones, with beautiful wedding rings and a rose on a satin pillow trimmed with pearls. Your wedding invitations will stand out with our unique wedding stamps, available with text saying Our Wedding, Personalized Stamps with the names of the bride and groom, RSVP stamps, and Thank You stamps. 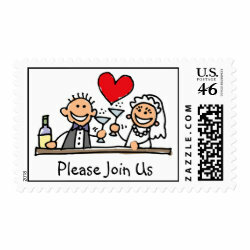 Our cute stick figure Bride and Groom stamps will give a sweet touch to your wedding mailings. 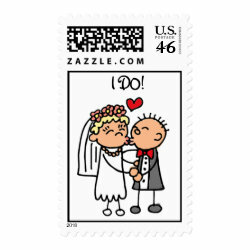 Whimsical cartoons of the Bride and Groom are available on postage with sayings such as “Please Join Us”, “I Do”, and “Happily Ever After”. These cute wedding stamps are perfect for your save the date cards, wedding invitations, and thank you cards! Text is customizable to say what you’d like, or personalize with your names. Autumn is a beautiful season for your perfect wedding! The colors of the turning trees provide great inspiration for your fall wedding theme. 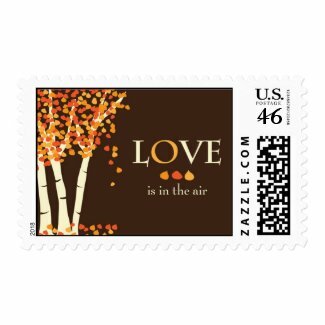 Choosing fall wedding stamps to enhance your invitations will help you set the tone for your special day, with the warm colors of the season.